Dave gets through the day the same way he runs a marathon... one step at a time! David Mogk is a professor of geology at Montana State University. He has recently worked on the development of the Digital Library for Earth System Education (DLESE) and the National Science Digital Library (NSDL). Dave has served as Program Director in the Division of Undergraduate Education at NSF (1995-96), is past Chair of the Education Committee and Education Division of the Geological Society of America, and is a past speaker in the National Association of Geoscience Teacher Distinguished Speaker program. At MSU, Dave has been the recipient of the Burlington Northern Award for Excellence in Teaching (1989) and the College of Letters and Sciences Distinguished Teaching Award (1995). He is also the recipient of the American Geophysical Union Excellence in Geophysical Education Award (2000). He is currently co-PI on numerous NSF-sponsored projects: CCLI National Dissemination project, On the Cutting Edge professional development workshop series for geoscience education; DLESE Community Services Center; and Microbial Life Educational Rsources (supported by the NSDL program). He is currently a member of the EarthScope Science and Education Advisory Board, and will be convening a workshop on EarthScope in the Northern Rockies in September, 2005. 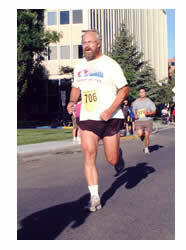 His research interests range from the evolution of ancient (>2.5 billion year old) continental crust in SW Montana, petrologic processes in the mid-crust, spectroscopy of mineral surfaces and the search for life in extreme environments (Yellowstone hot springs to Lake Vostok ice core) as co-PI of the Image and Chemical Analysis Laboratory at Montana State University. He received his BS from the University of Michigan and his MS and PhD from the University of Washington. Dave thinks that he can still compete in long distance running and Nordic ski races, and one has to ask, "What is this guy running to or from?" Manduca, C. A., McMartin, F., and Mogk, 2001, D.W., Pathways to Progress: A Vision and Plan for Developing the National METE Digital Library . Manduca, C. A., and Mogk, D. W., 2000, Digital Library for Earth System Education, A Community Plan. Univ. Olahoma, Norman OK.
Ireton, M. F. W., Manduca, C. A., and Mogk (eds), 1997, Shaping the Future of Undergraduate Earth Science Education, Innovation and Change Using an Earth System Approach, American Geophysical Union, Washington DC. Mogk, D. W., and Zia, Lee, 1997, Addressing opportunities and challenges in evaluation and dissemination through creation of a national library for undergraduate science education, Geosciences Information Society Proceedings, v. 27, p. 17-22. Brady, J., Mogk, D. W., and Perkins, D., (editors), 1997, Teaching Mineralogy, a workbook published by the Mineralogical Society of America, 406 pp. Including three chapters authored by Mogk. Mogk, D. W., and Mathew, E. A., 2000, Carbonaceous films in midcrustal rocks from the KTB borehole, Germany, as characterized by time-of-flight secondary ion mass spectrometry. Geochemistry, Geophysics, Geosystems (G3), American Geophysical Union, November 13, 2000 (e-publication). Mathew, E. A., and Mogk, D. W., 1998,Characterization of carbon compounds on a pyroxene surface from a gabbro xenolith in basalt by time-of-flight secondary ion mass spectrometry. American Mineralogist, v. 83, 918-925. De Stasio, G., Casalbore, P., Pallini, R., Gilbert, B., Sanita, F, Ciotti, M., Rosi, G., Festinesi, A., Larocca, L., Rinelli, A., Perret, D., Mogk, D., Perfetti, P., Minesh, P., Mercanti, D., 2001, Gadolinium in human glioblastoma cells for gadolinium neutron capture therapy. Cancer Research, 6, 4272-4277. John C. Priscu, Edward E. Adams, W. Berry Lyons, David W. Mogk, Mary A. Voytek, Robert L. Brown, Christopher P. McKay, Cristina D. Takacs, Kathy A. Welch, Craig F. Wolf, and Recep Avci, 1999, Geochemistry and Microbiology of Deep Subglacial Ice: Evidence for Life in Lake Vostok, Antarctica, Science, Dec. 10, 1999. Mueller, P. A., Wooden, J. L., Nutman, A. P., Mogk, D. W., 1998, Early Archean crust in the northern Wyoming province Evidence from U-Pb ages of detrital zircons. Precambrian Research, v. 91, 295-307. Mueller, P. A., Wooden, J. L., Mogk, D. W., Nutman, A. P., Williams, I. S., 1996, Extended history of a 3.5 Ga trondhjemitic gneiss, Wyoming Province, USA: evidence from U-Pb systematics in zircon, Precambrian Research, v. 78, 41-52. Mogk, D. W., Mueller, P. A., and Wooden, J. L., 1992, The significance of Archean terrane boundaries: evidence from the northern Wyoming Province. Precambrian Geology, v. 55, p. 155-168 (Special issue on the Limpopo Belt). Mogk, D. W., 1992, Ductile Shearing and Migmatization in an Archean High- Grade Terrane, northern Gallatin Range, Montana. Jour. Metam. Geology, 10, 427-438.